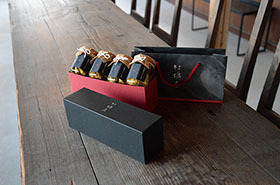 At our restaurant KAKIYA, KAKIWAI, all products are created in Miyajima. Professionals at our restaurant produce all products their selves from seasoning to packaging in Miyajima. We are particular about making all in Miyajima.